The KLIИT Karver is a superb example of a modern frontside carver with a bias toward race-like performance rather than recreational cruising. The Karver has a impressive command of edge-to-edge transitions on hard surfaces and rewards athletic input with a thrilling ride, but can be skied more casually than most carvers with this level of performance. The Karver holds lines and changes directions precisely and with complete control, even at higher speeds without any nervousness or "darty" behavior. It dampens vibrations very well while maintaining a very light feel underfoot. This is not a damp race plank, but a technical, precision carving tool with a wide range of friendy hehavior. This ski could advance an intermediate-level frontside groomer enthusiast to upper-level carving skills without demanding Herculean input, and make ex-racer types grin ear-to-ear as their daily frontside ski. The Karver should be considered one of the standards by which narrow-waisted frontside carving skis should be measured. Excellent ride with high-quality construction. Vertical laminate birch hardwood core, dual-layer Titanal sandwich construction, UHMW sintered base, stainless steel tail protector. 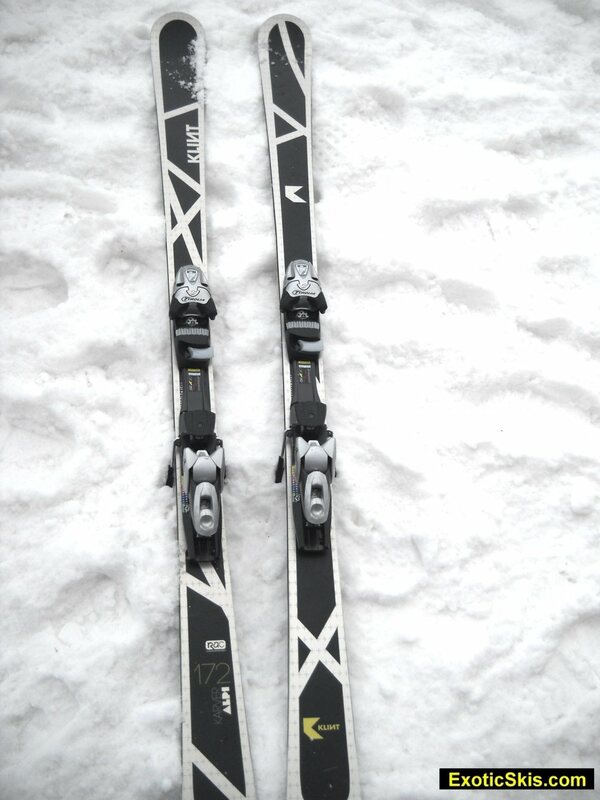 This pair was fitted with Tyrolia SP130 demo bindings, no raceplate. This model incorporates their "Reflection Applied Concept" which means they proportionally scale the geometry of the ski for each length, so the tip, waist and tail dimensions vary between sizes to produce the same relative personality traits among the different length skis. Manufactured by one of the most experienced ski facilities in the World. Top-shelf fit, finish and materials, strong, snappy rebound response to hand flexing. Strong torsional rigidity, thin vertical profile, lighter weight than expected. "Industrial" look with it's brushed-metal topsheet appearance. "Businesslike" look and feel. Modern frontside carver shape without excessively large shovel and tail widths (less radical than some carvers). The hardwood core should provide a very long lifespan for this ski. This initial report is the result of two runs on hardpack, ice, frozen granular and hardpack chalky groomer surfaces at a multi-day demo event in Vermont. Terrain was intermediate-level only, so this initial review should be taken with a couple grains of salt. I hope to get back out on this ski on steeper terrain. The KLIИT Karver grabbed my attention at the very first turn. The next few turns immediately made me grin as I picked up speed and began to bang out directional changes while picking up speed. The light weight and narrow waist, combined with a 127mm tip allowed the ski to shift edges and pull itself into turns with very little effort. 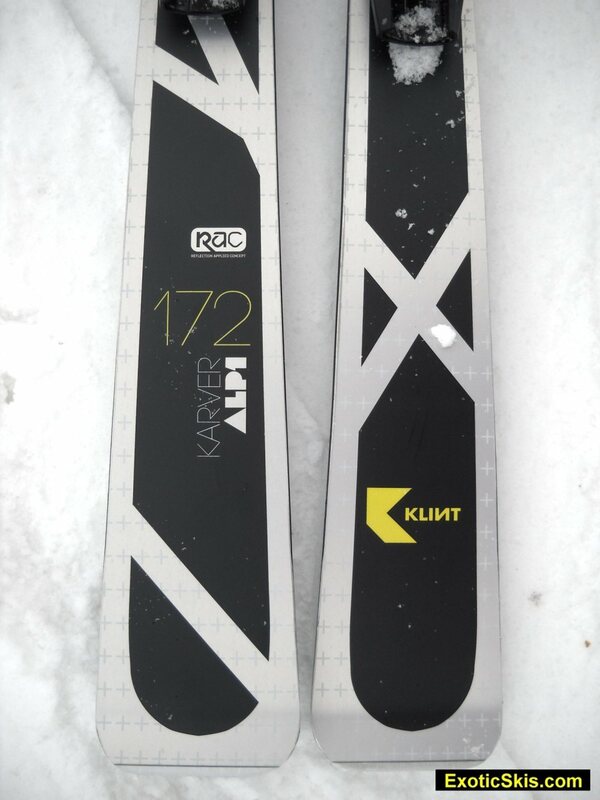 While some skis want you to roll them over and pressure them into the next turn, the Karver pulls you into the next compressed arc when you tip onto new edges. This means you get excellent turn initiation with very few calories required per turn. Once the Karver gets into its sweet spot radius, it is happy to hold itself there, or you can tighten or loosen the arc smoothly as needed without any loss of confidence or security. Some carving skis like to ride in their design radius, but get balky if you try to tighten it up, but the Karver is happy to adjust turn shape on command without any change in grip underfoot. That's a good thing. The Karver has no hint of nervousness or darty behavior, thanks to two layers of Titanal (one below and one above the birch core), yet has none of the "metal battleship" feel of some race skis or carving skis trying to achieve the same performance. The Karver also has a remarkably wide range of speed, allowing you to ride it slow and gentle, weaving back and forth without effort, or turn it up to race-pace and drag your hip across the hill with race-like acceleration on demand. Conditions for this test were excellent for carving skis, with a mix of real ice, eastern boilerplate, packed powder and granular snow, and the Karver's behavior was quiet, confident and agile on everything I could find. While there was no thick snow available to test the handling of these skis, I will assume they will behave like a 72mm waisted ski. Hopefully we can get out on the Karvers in softer snow this season and see how they behave off their hardpack home surface. A high performance club-racer Porche for civilians. My favorite quote from PhilPug at EpicSki.com describes this ski perfectly: "This ski is like a drug." Nothing at all, but maybe dress up the graphics a tiny bit with a piece of discrete and bolder color, but the industrial grey look grows on you. This is a superb example of what a modern frontside carving ski should be. Race-like grip and powerful response with razor-quick reflexes in a well-controlled, lightweight chassis. Not for soft snow. Expect to hone your carving skills with this ski. Don't expect to have any fun in soft snow. This is a ski designed for excellent hardpack carving without needing to be an olympian athelete. "Manufactured by one of the most experiences ski facilities in the world." Uhhhhhhh that is just nice away of saying "Made in China"
I always laugh at how companies like this come up with creative answers to where their skis are built. Klints SIA press release said"over 60 years of ski building experience" in their first year as a company. 30 chinese workers with 2 years each? Not sure Klint really fits into the "exotic skis" profile. "Can I get a pair that doesnt say KLINT on them?" Some people don't like skis "made in China", and that's fine. The Swallow ski company (headquarters and historical manufacturing in Japan, with expanded factory facilities in China) has a decades-long history of making everything from high-end skis to entry-level and rental skis. We have seen the Swallow line at trade shows and personally tested a few Swallow skis, and found them to be really good skis. Swallow has the resources and skilled technicians to make excellent skis, and make several models of some "big name" skis. Personally, I have no problem with where skis are made, unless I want a ski built in a specific country. 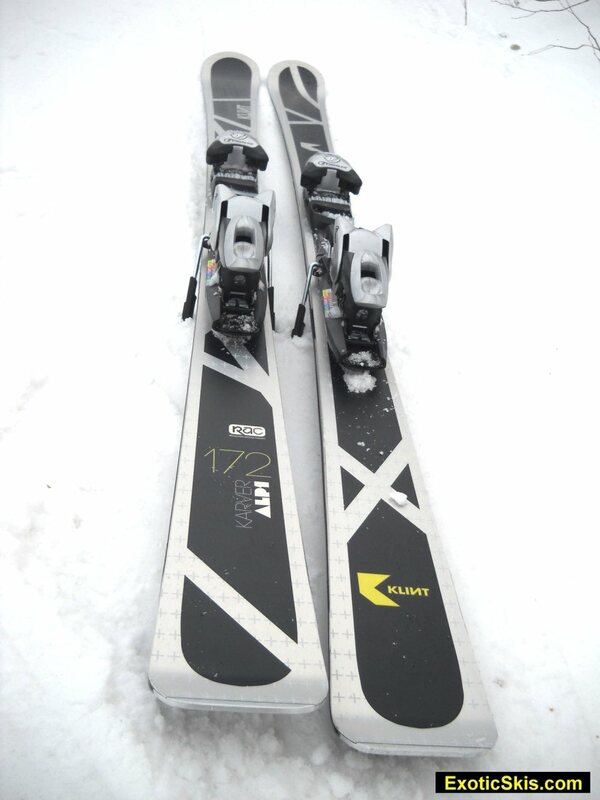 Chinese-manufactured skis such as Liberty, DPS, SkiLogik, APO, Black Diamond, BlueHouse, Swallow, PlayMaker and others can be excellent peformance and quality. It all depends on the specification of the designer and the quality control standards they employ. Sure, there can be some low-quality skis built by Chinese (or any other country) facilities, but there are also some excellent-quality skis coming from the factories in Asia. Klint is one example. I'm skeptical about any brand until I see them in person and try them on snow, and the skis from Klint are the real deal. As far as being "exotic"...Klint is one of the new upstart brands with small volume, and we like to check out as many alternatives to the big-name ski companies as possible...that's why we list them and test them here! "...Our manufacturing team brings to the table more than 60 years of quality ski manufacturing. The factory has the capabilities to produce more than 350,000 pairs of high quality, performance skis each year. Our materials are sourced from the best suppliers all over the world - 2mm thick stainless steel edges come from Japan, bases come from industry leader ISO in Austria, top sheets either are Duraclear from France or ISO again, fiberglass from Japan..."
1: Learn how to spell. 2: China makes great skis..what are you skiing on? I would love to know. Okay, one small spelling error, slow your roll, tfav. I Just dont see how a "small" company that is having their skis cookie cutter made in China in the same factory and the same materials as everyone else really fits into the context of these forums. People that actually make the skis they sell, I thought that was what this was all about.